For the first time ever, an Israeli aircraft was allowed to fly over South Sudan on Sunday. The flight was carrying PM Netanyahu on his return from his historic visit to Chad. The El Al plane transporting Netanyahu flew over South Sudan, whose skies are under the control of the civil aviation authorities in Khartoum. 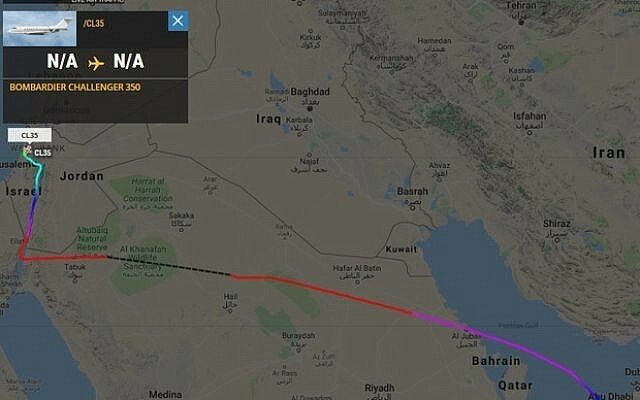 Meanwhile, in another prominent diplomatic development, Israeli officials traveling on a private jet from Abu Dhabi, were flown to Tel Aviv on a direct flight, traveling through Saudi Arabian airspace. According to the Emirati news report quoted by the Time of Israel, the private jet was carrying unnamed Israeli officials following a clandestine visit to Abu Dhabi back to Tel Aviv. It is reported their visit was part of required preparations for a landmark visit by United Arab Emirates Foreign Minister Sheikh Abdullah bin Zayed Al Nahyan to Israel. That planned visit is reportedly going to be preceded by Prime Minister Binyamin Netanyahu visiting the UAE. According to Times of Israel quoting the Emeriti report, Sheikh Al Nahyan and Chief of UAE Intelligence Tahnoun bin Zayed were among the passengers on the Tel Aviv-bound flight. The flight was given permission to fly via Saudi air space, thereby eliminating the need for a stopover in Amman. This appears to be a part of Prime Minister/Foreign Minister Binyamin Netanyahu’s ever-expanding efforts to establish diplomatic ties with Israel’s Arab neighbors. Earlier today YWN reported about Netanyahu’s historic visit to Chad. Previous article48 HOURS After Crash, 97-Year-Old Prince Philip Driving Again – Without Seatbelt!